Investigators in Turkey are trying to establish why a high-speed train came off the rails between Istanbul and Ankara, killing at least 36 people. The head of Turkey's railway network, Suleyman Karaman, says sabotage was not to blame for Thursday's disaster. Officials have rejected some reports that the train, with 230 people on board, was going too fast. 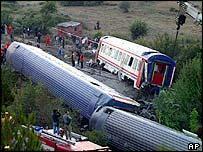 The packed express derailed near the town of Pamukova, in north-west Turkey, at 1945 local time (1645GMT). The government crisis centre initially put the death toll at 139 - but later revised the figures downwards.